DefenceWinsChampionships wrote: I dunno. It's sounding a lot more probable that Stone is being traded. Should be interesting to see him play against Winnipeg tomorrow - a team that's been rumored to want him but only as a rental. Winnipeg is in cap hell next season with Laine , Trouba, and Connor looking for new deals. I could see something along the lines of Stone for Perrault, Vesalainen, Roslovic, 1st rd pick + conditional 1st rd pick (if Stone re-signs). That's a ton to give up IMO. I love Stone and don't even want to think about dealing him right now but I wouldn't expect that much. Agreed. The asking price is too high right now and if it doesn't come down then Stone and Duchene will be here until the end of the season and walk for nothing. I don’t know in what universe does Ottawa get that return. I imagine you’re counting on Perrault having negative value for that to even make sense. And it doesn’t. You’re lucky to get Roslovic(who they have no interest in trading, a 1st and another piece of lesser value. I’m sure not discounting the possibility of Dorion messing this up. Nice of the Sens to present Clutch with a win on his birthday. Happy Birthday Clutcher. And whatta game by our Mighty Senatores. Never a dull moment. Nice of them to throw a win in there on my birthday for sure. They were talking on 1200 this AM about the mismanagement of assets in Ottawa. While I do think some assets have been mismanaged, I think Dorion/Murray made some good decisions. Methot: Seems like his career could be over. Has only played 45 games and registered 3 points in Dallas. Ceci will fetch a 1st or 2nd rd pick if traded. Turris: 0.5 ppg player this season on a 6x6M deal. Has been injured for the majority of the year. Could be an awful contract if he can't get healthy. Brassard: Traded for a goalie, 1st rd pick, and Cole (re-traded for a 2nd). Recently traded again from Pitt. Injury problems and won't put up same numbers as he did in Ottawa. Spezza: Awful return but only had two good years in Dallas after his five year extension. Has since been a cap hit and defensive liability in Dallas. Heatley: We won that trade with SJS. Return may not have been amazing, but he was a piece of dung. Karlsson: Contrary to popular belief, I don't think he ever intended to re-sign here. Lots of picks and pieces, including two prospects that have top-six potential. And we can't rule out whoever we draft with the 1st rd pick just yet. Phaneuf: Arguably the worst dman in the league this year. Traded him and his cap hit for someone on LTIR and less of a cap hit. Might be Dorion's best trade as GM. Our retention of players and trades may not have been the best at the time, but looking back I think the organization made some pretty smart decisions. I think we end up keeping Stone, and the return for Duchene will salvage some of what we gave up for him. Yeah, some of the moves have been good, and others haven't been great (Hoffman and Burrows come to mind). The problem with the franchise hasn't really been asset management...it's been Melnyk. tim1_2 wrote: Yeah, some of the moves have been good, and others haven't been great (Hoffman and Burrows come to mind). Melnyk can only be blamed for Karlsson. Burrows was Dorion. Dahlen is just over 0.5 ppg in the AHL - tied 5th in Utica. He'd be 5th in Belleville now behind Chlapik and Balcers who have both missed time and/or spent time in the NHL. So really 6th or 7th and I'd argue maybe 8th seeing that Carey and Wolanin would probably be ahead of him over 50 games. And Hoffman... that was an unfortunate situation. Dorion probably felt like he needed to get a roster player back. Not a good trade but they had no intention of trading him in the off-season. And if they did, the situation obviously lessened his value. DefenceWinsChampionships wrote: They were talking on 1200 this AM about the mismanagement of assets in Ottawa. While I do think some assets have been mismanaged, I think Dorion/Murray made some good decisions. No joking around, Phaneuf is up for the anti-Norris. A horrific player this year - and Sens fans all saw it coming. A stunning move that Dorion got someone to take him. Pro scouts my backside, LA has none of those (nor do we BTW). DeMelo and Tierney have been much better than expected. That's pro scoring. wprager wrote: DeMelo and Tierney have been much better than expected. That's pro scoring. 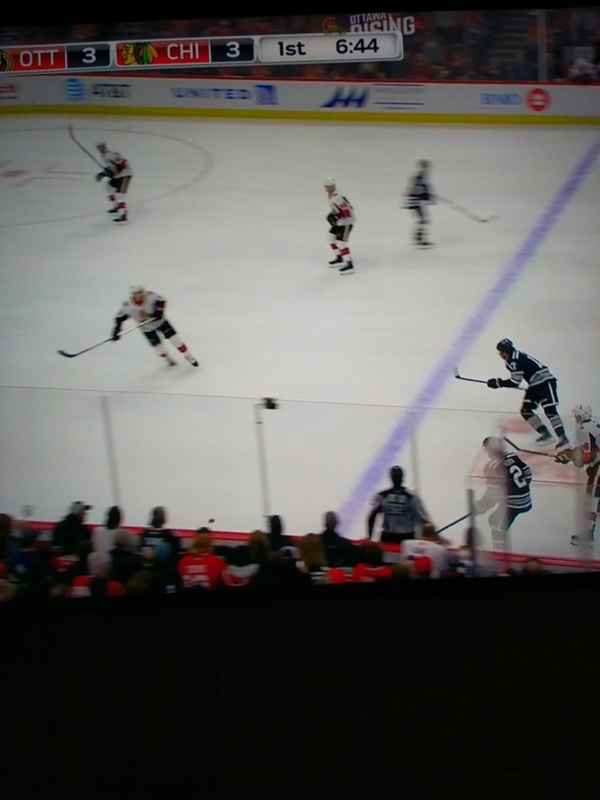 How the hell was the 4th goal not called offside? That little dot above the head of the guy in red is the puck. Out was just shot into the zone by the Hawk player on the boards. The goal came seconds after this. 679 Re: Ottawa Senators (present and past) TIDBITS & QUICK HITS!